Atlanta is really beautiful in early Spring. The trees are all flowering-pinks, whites and reds. The forsythia is blooming and soon the azalea will begin to bud. The pine has not started yet so the pollen count is still manageable. But this is the rainy season. The forecast last night was for bad weather coming in from the west. It looked like it was heading right for where we were planning on going. Change of plans...no hopping today. I don't mind the rain but lightening and tornadoes..not so much. I decided to head out to Sweet Home to support Melisa. She has worked so hard on Shop Hop. I figured I could be out and back before it got really bad. I bought a book and some pretty fabric to make a project from the book. This afternoon, I decided to check out the shop in Braselton as the rain was lighter. The bad weather must have stayed south of the city. The directions to the shop were minimal and I got lost. I am not quite sure where I was but eventually found my way back to 985 and called the shop for more specific directions. Tomorrow I will meet Louise and we will go over to the shops in Marietta. If it is nice next weekend, maybe we will head down south of the city. I look forward to hearing about Becky and Gretchen's adventure today. Shop Hop is in progress. It started yesterday. I can not go until tomorrow. I spoke to Louise the other night and she intends to be at my house at 9AM to get started. I think we will head down to the shop in Newnan first because it is the greatest distance. I skipped shop hop last year so I have never been to this shop.My friend Becky has fabric and projects in mind for her hopping but since I need kn fabric and have enough projects on the list for many, many years, I have not done that. The weather is not supposed to be that great. I am not worried about rain but I sure hope any severe weather stays away. I think tonight I need to so some thinking about what I want to complete. I bought a backing for one quilt the other day at Sweet Home so that is one down. But now it is time for the first cup of coffee for the day! I worked for Kindred Health Care for four and a half years. I left that job over three years ago. Remember the math. I am still haunted by this company. Yesterday I was supposed to be deposed once again. This is the third time. Three different cases. This company pulled out of Florida due to litigation concerns. i think they should have pulled out of Ga as well. I am so tired of being asked about things that happened five years ago. I don't remember the residents. They all blend together. Old people in wheelchairs. I guess that sounds kind of cruel but it is the truth. And the truth of the matter is that these families sue and it is the lawyers who collect the majority of the money. By Tuesday night I was so mad. I don't remember this person at all. I will be asked questions about paperwork. It is such a waste of my time. And then could I come in early so they could review more paperwork. I didn't go. But I will have to go on April 7th and will be subpoenaed to be there. So Kindred gets sued again and I get screwed again because I have to use PTO time to be there. Hostile witness????? you better believe it! Kindred lost the last law suit and although it was unfortunate and the outcome unavoidable, I hope they have to pay through the nose!! On the other hand, it impacts on the aging population because there is going to come a time when no one will want to take care of the frail elderly because to the lawsuit happy public. I guess we will all have to be launched onto ice flows to perish....oops global warming....no ice I make a joke but it is not a funny situation. Dark Thirty..not even the birds are up yet.. I have been awake since about 4AM and I finally gave up and got up. I knew this was going to happen when I fell asleep on the couch last night. When I woke up, it took me quite awhile to get myself into the bedroom. I made a run down to Sweet Home after work yesterday to get the borders for this weekend's project. I am going to love it. Melisa made great choices. Mike was at the back door when I got there, so I went in that way. BAD MISTAKE! In the Civil War room there is a new line of fabric that is GORGEOUS. BAD MELISA strikes again. The line is in blacks, beiges and grays. (It screams Gretchen by the way). So having nil will power, I got some. Also picked up a backing for Sassy 16. My thought process was that I needed to get it before Shop Hop and it is all gone. Shop Hop is starting on Thurs. but since I need to work to support my habit, I won't be hitting the stores until Saturday. It seems like the weekend flew by but I guess I always feel that way. Sunday afternoon I headed over to the new shop Patchwork Cottage for her official opening. We quilters are a happy band of people. Becky was already there when I got there. Saw lots of others too. I visited with Wendy. I am glad she is working there. She has a good eye and I always could count on her to help me find just the right fab to complete a project. I also chatted a bit with Pat Sloan. She is teaching a class there today but alas I must work to support my habit. 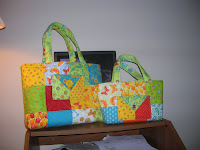 Becky took pictures and posted on her blog (Quilting Booklady). My friends know how to do something so you just point and it jumps you to the blog but I don't know how to do that. See my link in the meantime! Then I came home and finished Saturday's project. All it needs now is borders. It will be a very bright and happy quilt. Good news...5 days until Shop Hop. Gretchen wanted to know if I have made a list. Well, that would be a big no but I still have time! 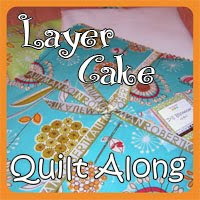 I think it should be national quilting week but that is just my opinion! Today was Thimbles and it was grand. Most Exalted High Thimble was in attendance and she looking quite well considering she is only 5 weeks post new knee. It was good to see her again. It was, as usual, great to see all of the gals in the group. Gretchen was missed but she is away on a relaxing weekend. 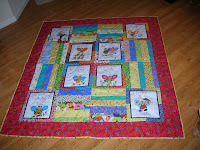 Becky worked on binding and started on a flannel rag quilt. 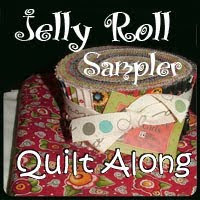 Cindi was just cutting away at her latest project-a quilt from the favorite Jelly roll book. As for me, I could not decide what I wanted to work on today. 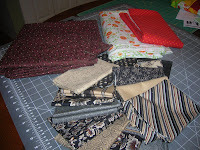 I foraged in the sewing room and came up with any number of projects that I could do. Since it is officially Spring as of yesterday, I needed to do something bright. 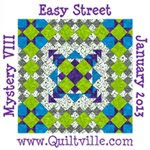 I decided to take my jelly roll of Fresh and I found a quicky pattern. Of course, then I had to make an emergency call to Melisa to make sure she still had fabric for the border. I can never do anything easy!! She does and I will run down on Mon after work and pick it up. We talked about plans for next weekend and the Shop Hop but nothing is definite yet. I will be doing the hop with Louise. I have to map out the plans but we will do most of the shops on Saturday and finish up on Sunday afternoon. Hopefully we will get all the shops but the Marietta ones on Saturday because they are spread out. Not that I need anything but I am looking forward to seeing what the other stores have. And now I must go continue celebrating this most important holiday! Happiness is Spring...and that is upcoming when? oh yes, this weekend! Happiness is sunshine, robins, flowering trees....saw it all today. AND the pollen has not started to escalate yet. But that is another story. I did my best to prepare for these upcoming events by resting on the couch this evening. Gotta conserve the energy. I made another little purse yesterday-out of the Fresh line from Moda. It is a happy purse. I also started to make a Bad Melisa bag out of the same line. Do I know what to do with these bags? But this one will be for Spring/summer, of course. And it matches nothing...even better! Guess I should go to bed...TGIF tomorrow!!!! 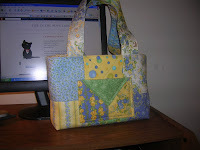 This is the new bag.....it can't be considered a Bad Melissa bag as it is too small to load up with fabric purchases. It is just the smaller version of it. I got the pattern last weekend. Sarah and I talked about it at the show. I don't know if she picked up the pattern as well. It also has a handle variation which I need to look into but for now I used more of the charm squares sewed together. It is right springy...now if only Mo Nature will get with the picture. It is cold and rainy yet again. Off to church. Sure hope the new priest is up to Emma! Do I have things that I should do? Will I being doing them? It is one of those rainy,dreary days here and I feel the couch calling me. But I will resist, at least for awhile. I having some straightening to do and then perhaps I will wander into the sewing room. I bought those fat quarters last weekend at Dragonfly and I need to find a project to do with them. Also I would like to make a smaller version of the Bad Melissa bag that I have made a couple of times. But in the meantime, Henry is sitting on my lap..my blogging buddy! Sue fixed my facebook and I now have catbook on my profile with pictures of all my boys. Who is a sick puppy? In a moment of sheer insanity, yesterday when I was at Publix, I bought a corn beef. Also, a head of cabbage. After I cook it, I will be eating it all week. Headed over to Sue's house this afternoon to deliver the quilt. I caught her home between Sarah's ballet class and Emma's soccer practice. I am so glad those days are over for me (sorry Sue, but before you know it the girls will be all grown up-just like you and your sisters). When I got back to this neck of the woods, I had a treat in my mailbox. My fat quarter swap has arrived from Australia. What fun! I got the most gorgeous blue tone on tone and a delightful blue with little yellow flowers.AND another delightful surprise-a sweet bag. I will bring it to Thimbles so y'all can see it. I hope to stay in touch with Lyn via email. Will have to work a little later tomorrow as I left early today because I felt really weird-light headed. It was bizarre. Don't know what was going on but I seem to be better now. You can tell we have had a few warm days here in the ATL. The Bradford pear trees have popped and are just full of their tiny white flowers. They are so pretty from a distance. I know that up close, they so not smell good but I really like seeing them from afar. It was so beautiful and warm this afternoon. And it is still too early for the pollen season! I know that it is coming but just for today, it was wonderful. 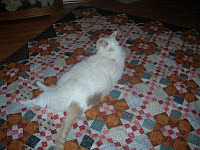 Sue asked me yesterday how the quilt was coming. I had not touched it since the great snowstorm last weekend. Yikes!! She needs it this week. So I cam home yesterday from church and started sewing. I needed to put the border on, layer it up, quilt it and make and sew on binding. Mission accomplished. i finished it last night. It is not my best work but it will have to do. 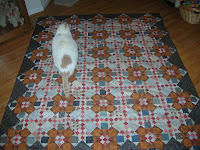 I am not happy with the quilting. I will take it over to Sue's after work today. And I can pic up my GS cookies too! 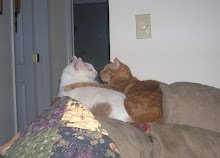 Laurie's blog has a funny picture of Lilly with her 2 "cousins" Check it out for a giggle! I forget when you get outside of the metro Atlanta area, you are in the country. I decided that I would go check out the quilt show in Watkinsville today. I left here (after the laundry was done) and headed out Ga316 toward Athens. The venue was on Hog Mt Rd and when I saw that, I detoured from the directions and headed that way. There is not much on Hog Mt Rd. It is a good thing that I had a full tank of gas! I could have bought a cow today. I saw a sign "cattle for sale" but decided that the back yard just is not big enough for a cow! I enjoyed looking at the quilts that were displayed. Visited with Melisa and left some money there. Also visited with Sarah of Thimbles/yoyo fame. Headed over to the quilt shop Dragonfly's and ran into Sarah again! I bought a book and a couple of fat quarters and then headed home. Thought about detouring down to Sweet Home but my hands were really hurting, so I just came home. I had an email from my fat quarter swap partner. The package arrived in Australia. What fun to hear from someone on the other side of the world. I decided that I am not going to put a border on it cause I like it the way it is-all 8 million teeny little pieces! Spiff checked for correct settings and gave it 2 paws up. It's good thing or there would be no supper for him! When I went back and checked, the quilt I put the binding on is #4 for this year. I need to give myself the proper credit!! I woke up early to the news announcing all the school closings due to the weather. I looked out the window when it got light and the roads here did not look bad but there is that black ice thing. My boss called me about 7 and said she was not going in because she had babysitter problems and don't worry if it is bad. I decided to wait until the sun could do it's job and then go in. I got to work some time after nine. Some of the roads were still not great-especially when making turns over ice. No sanders out in Snellville. Good thing we got to work. Q. also found daycare-we arrived at the same time. And then the state arrived on a complaint about 11AM. We had computer problems since the home office was closed, so could not give her the census report. Had to use last Fridays and make corrections. At any rate, day was okay and I left about 4. 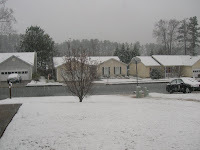 I've been reading other blogs and I am in the minority...snow is just another four letter word....white s--- catch my drift? 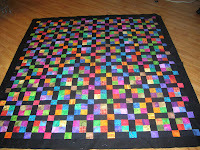 I finished working on the quilt for Sue's raffle. Sue ironed and I sewed. It still needs a border and then I can layer it up and quilt it. Driving home was not really bad. The roads were very slushy. This is the most snow we have had in a very long time. But then again, if I never saw snow again, I would not mind. And now I am home again-safe and sound. I will work on binding from the quilt picked up yesterday. No tv-direct tv doesn't work when it snows, I guess. No big deal-nothing on anyway! Me: what do you want to drink? Me: does your mother let you have that for breakfast? Somewhere along the line I have forgotten mother 101. Do not ask what they want. Put a damn bowl of oatmeal in front of them. But that is not Grandma 101. Sarah says her parents are party animals and therefore, she and Emma have another sleepover next weekend. Auntie Eww(Laurie) is scheduled for that one! Right now the girls are still passed out on the couch. 2 decent beds in this house and they decide to sleep on the couch (and would I please sleep in the livingroom with them)! It is a good thing that I have a big sectional but this morning they are both down at one end. Sarah's legs are hanginf of the fronth edge. We did a road trip to Lilburn yesterday afternoon to pick up the quilt at Peggy's and then stopped at Publix to picl up stuff to make cookies. I cheated and we made the refrigerator kind. Then to Mickey D's for some supper. We had our picnic on the livingroom floor-kind of a tradition here at Meena's house. The toys are strewn all over the floor. I will be picking up Polly Pocket apparrel for awhile-I think one of the boys thought that this was a new toy! Both Sarah and Emma helped wind bobbins and did "pedal work" while I put the binding on the new quilt. It was a bit of a challenge to sew but we did! Forgot the trip to Bad Melisa's in the morning. Double Delight will have blue setting triangles. I love it-it looks great and calms down the pink. I'll post a pix when it is together. I have only 2 seams left and it is done! I am not going to put a border on it. I like it just the way it is. Emma is awake and says she needs help to get dressed. It has been a long time since I did that!